IIASA researchers have introduced a new, simple measure for human wellbeing across countries, called the Human Life Indicator (HLI), that takes inequality into account and could replace the commonly used but error-prone Human Development Index (HDI). Measuring the overall wellbeing of populations is crucial for evaluating the success of policies. The Human Life Indicator expresses wellbeing in terms of years of life, similar to life expectancy at birth. However, unlike any other current measure, it takes not only the mean value but also the inequality in longevity into account. The wide availability of mortality data means that the HLI can be used for reliable comparisons of wellbeing across countries, in the past as well as the present. Imagine an extreme case where half of the population live until they are 90 years old, but the other half die at age 30. The life expectancy of that population will be 60 years – the same as in the arguably better situation in which all members of the population lived to become 60. The HLI can distinguish between these two cases: If all members of the population live to the same age, in this case 60 years, the HLI equals 60. In the case of above where half the population dies at age 30, however, the HLI would be reduced to 52. Early attempts to quantify wellbeing focused solely on economic factors, such as the Gross National Income per capita. In 1990, the UN added two additional dimensions, education and life expectancy, to create the more comprehensive HDI. Despite it being criticized due to statistical and conceptual flaws, the HDI is still widely used today. "People have been using the Human Development index because there was no alternative – we now provide that alternative," says IIASA researcher Warren Sanderson, a coauthor of the study. One problem of the HDI is the redundancy of the three dimensions considered. Highly educated people tend to be richer, and on average, experience longer lifespans, making it unnecessary to combine all three of these factors. This is why dropping the education and economic dimensions in the creation of the HLI leads to an enormous simplification without a significant loss of information. The HLI sometimes produces different rankings of countries than the HDI. Norway, for example, has been leading the HDI ranking for decades, in part due to their income from North Sea oil and gas. 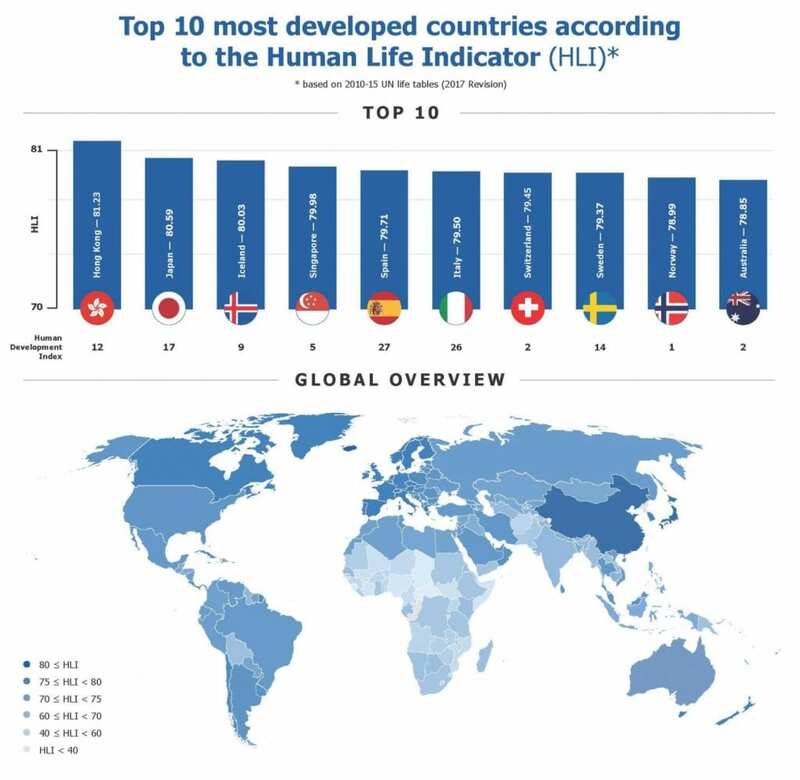 However, Norway is only 9th in the world when ranked according to the HLI, which means that its high income has not been sufficiently translated into longer and more equal lifespans for its people. Similar disparities between the HDI and HLI rankings can be found for other developed countries, like Australia (2nd according to the HDI, 10th according to the HLI), and the US (8th according to the HDI, 41st according to the HLI). Most of the countries, however, score similarly in the HDI and HLI rankings. Another advantage of the HLI is that it can be calculated even when information about education and economic wellbeing is not available. This means that the HLI can provide a measure for human development that goes back further than the introduction of the HDI in 1990. By evaluating the wellbeing in selected countries over time, the researchers show that the behavior of the HLI reflects the major political and economic events across the world in the last century, for example the world wars in European countries, or the Vietnam war in Asia. One of the 17 UN Sustainable Development Goals is reduced inequality. The HLI can be useful in assessing progress towards that goal for two reasons: Firstly, the index takes inequality in lifespans into account for the first time. Secondly, the HLI can also be used to measure inequality in countries where accurate and comparable data on economic conditions or education are not available. The ranking of countries according to the HLI is publicly available on the IIASA website. In the current ranking based on the 2017 UN life tables, Hong Kong places first, followed by Japan and Iceland, all with indices above 80. "We hope to further the discussion on how we think about the wellbeing of countries," says Sanderson. This research has received funding from the European Research Council under the European Union's Seventh Framework Programme (FP7/2007-2013) under grant agreement No 323947. Project Name: Reassessing Aging from a Population Perspective, Re-Ageing.